CAMBRIDGE, Mass., May 14, 2012 — The first practical artificial leaf, composed of silicon, nickel and cobalt, can convert sunlight into chemical fuel, a milestone in the drive for sustainable energy that mimics the process of photosynthesis. Unlike earlier devices, which used costly ingredients, the MIT-developed artificial leaf is made from inexpensive materials and employs low-cost engineering and manufacturing processes. It has a sunlight collector sandwiched between two films that generate oxygen and hydrogen gas. When dropped into a jar of water in the sunlight, it bubbles away, releasing hydrogen that can be used in fuel cells to make electricity. The self-contained units are an attractive solution for making fuel for electricity in remote places and the developing world, but current designs have relied on rare-earth metals, such as platinum, and on costly manufacturing processes. To make these devices more widely available, Daniel G. Nocera of MIT replaced the hydrogen gas-producing platinum catalyst with a less-expensive nickel-molybdenum-zinc compound. 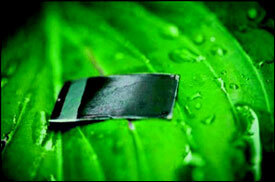 A cobalt film that generates oxygen gas was placed on the other side of the leaf. “Considering that it is the 6 billion nonlegacy users that are driving the enormous increase in energy demand by midcentury, a research target of delivering solar energy to the poor with discoveries such as the artificial leaf provides global society its most direct path to a sustainable energy future,” Nocera said. The research, which received support from the National Science Foundation and the Chesonis Family Foundation, appears in the American Chemical Society journal Accounts of Chemical Research.